We’re having a hot summer in Switzerland. Tomorrow, the temperature is going to hit 96 F (36 C). 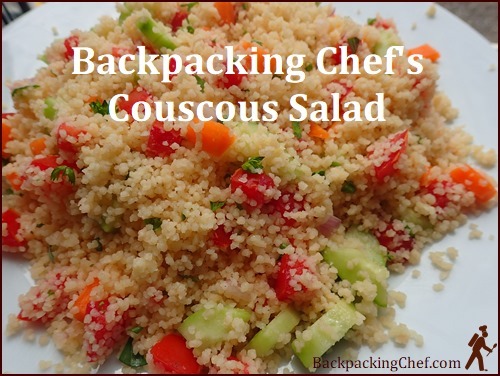 That got me and Dominique thinking about making a delicious cold couscous salad for the trail. As you know, I carry a 24-ounce capacity Thermos Food Jar on all my hikes. I use it mostly to prepare hot lunches in the mornings. But the Thermos is equally useful for keeping food cold. This recipe is intended to be made the night before the first day of a backpacking trip or before any day hike. When you pack the meal in the Thermos in the morning, it will keep cold for up to twelve hours. You could eat it for lunch if you start hiking in the morning, or eat it for supper if you start hiking later in the day. I optimized the recipe to fill one 24-ounce capacity Thermos Food Jar to the top. I would call it an extra-large serving. Two people could split the contents and be well-satisfied, perhaps with a cookie for dessert. The ingredients are all fresh and cooling. Perfect for the first hot summer day of your hike. I really enjoyed this meal. 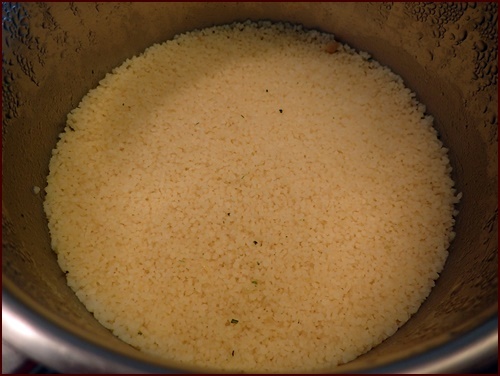 Photo above shows cooked couscous in pot before fluffing with a fork. Add a chip of bouillon cube (about 3 grams), plus a pinch of salt, to ¾ cup of water in a small pot. Bring water to a boil. Stir in couscous and immediately remove pot from stove. Keep the lid on the pot. Wait five minutes. Add one tablespoon of olive oil and fluff up the couscous with a fork. Put cooked couscous in a storage container and place in refrigerator to cool. Photo above shows what the couscous looks like after it is fluffed up with the added olive oil. 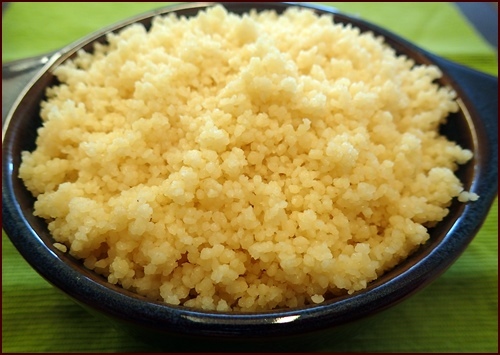 The yield of ¾ cup couscous is 2¼ cups cooked couscous. I forgot to include the ¼ lemon in the photo. Optional: A few ounces of crumbled feta cheese would add protein and an additional flavor element. Combine vegetables, including the gratings and juice from the quarter-lemon, with cooled couscous. Add salt and pepper to taste. Fill the Thermos Food Jar in the morning. Hint: Chill the inside of the Thermos before loading by placing it in the refrigerator for a few minutes with the lid off. After your trail lunch, you can add assorted dried fruit to the Thermos with cold water, so you can enjoy a refreshing fruit cocktail later in the day. I know you will love this recipe on the first day of a hot summer hike. But I’m interested in hearing your ideas about how you would make a cold couscous salad for the trail. Reply to this newsletter with the ingredients you would combine with couscous to make a tasty cold couscous salad. I’ll pick one submission, and the winner will receive a copy of my new trail journal, 1001 Miles on the Appalachian Trail. Deadline to reply is August 7. (Next Monday). I’ll share the most interesting suggestions in a future newsletter. That’s it for this month. Stay cool, and we’ll see you in August.